The clamp down on discretionary spend looks set to extend to special occasions, with IBISWorld expecting consumers to reign in their spending on Father’s Day this year. The analyst group forecasts growth on Father’s Day spending to remain static at around $28 per family, less than half of what was spent on Mother’s Day earlier in the year. Despite positive employment news, wages growth and rising disposable incomes, consumers continue to keep a tight reign on their purse strings having changed their attitudes towards consumption in response to tight times over the past five years. The news that frugal behaviour may spread to special occasions is another blow to the struggling retail sector markets, which markets heavily around special events. General manager of IBISWorld in Australia, Karen Dobie, says the focus for gifts will be on low key gifts, such as dining out, picnics, a good book or gift vouchers. “While every Dad is hoping for a new gadget or tool to play with, value-conscious families will continue to chase bargains this Father’s Day and detract from the popularity of these purchases”, Dobie says. Gift vouchers, books and CDs are categories expected to be favourites this year, with spend on these items forecast to increase by 7.6% and 7.1% respectively. Spend on eating out, a perennial favourite on both Mother’s and Father’s Day, is expected to top the overall spending in dollar terms, with a 5.1% increase on last year. Sporting goods and clothing have fallen out of favour since last year (decreasing by 3.3% and 2.1% respectively), while spending on hardware, personal care items and electronics will remain relatively flat. 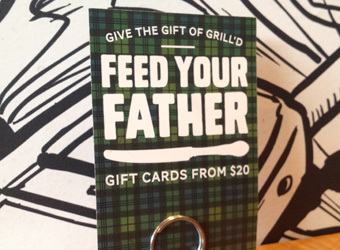 $659.9 million is predicted to be spent on Father’s Day in 2012, a mere 1.9% increase on last year.